The subject was a 29 year old man who had been assaulted with a brick. He became comatose and died 3 days later. A forensic post mortem was required. The specimen is an axial slice of the brain through the basal ganglia and thalamus. 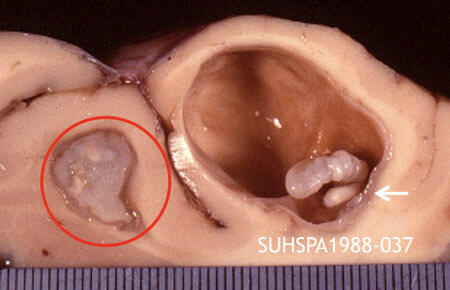 A haemorrhagic lesion with swelling of the brain parenchyma can be seen in the left temporo-parietal area; this is the acute contusion injury from the assault. Also seen in the specimen are several scattered cysts about 0.5cm in diameter. 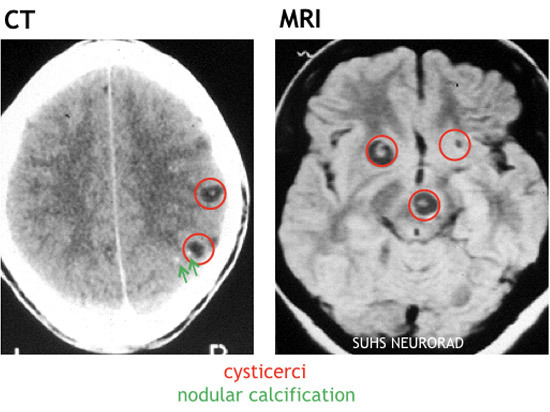 One cyst in the head of the caudate nucleus contains the single protoscolex characteristic of Taenia solium. In this enlargement of the cysticercus cyst one can see the protoscolex protruding into the cyst cavity. This is an H & E stained section through a cysticercus cyst, magnified x 25. The protoscolex is invaginated into a cavity lined by a germinal tissue membrane. 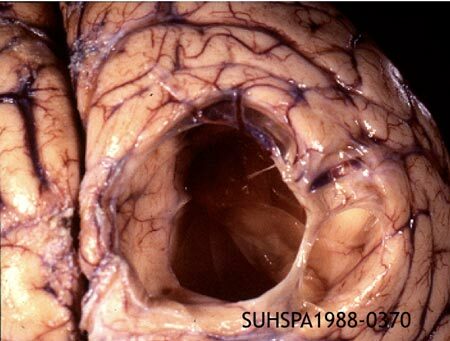 Single or multiple decaying cysticerci in the brain parenchyma are epileptogenic. 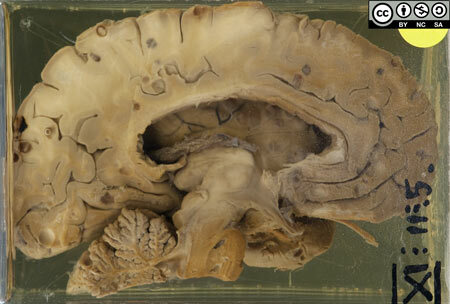 Neurocysticercosis is a very important cause of epilepsy in children and adults in South Africa. Here a man has ingested tape worm eggs shed in the faeces of another person, or possibly his own faeces. The hexacanth larva is released from the egg and penetrates the small bowel. Within days of settling in its favoured site (brain or muscle), the larva metamorphoses into the metacestode or cysticercus. Infection with the adult T. solium worm is known as taeniasis. Infection with T. solium larvae is known as cysticercosis. And if infection occurs in the brain, neurocysticercosis. 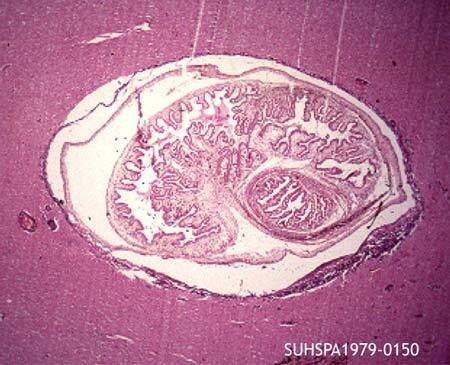 A granulomatous inflammatory reaction develops around the embedded decaying parasite. The cyst content becomes a densely proteinaceous debris, forming a cystic granuloma whilst at the same time undergoing resorption & shrinkage. Ultimately the inflammatory reaction is cleared away, leaving a calcified nodule. This X-ray showing multiple calcific nodules was undertaken in a case of trauma. 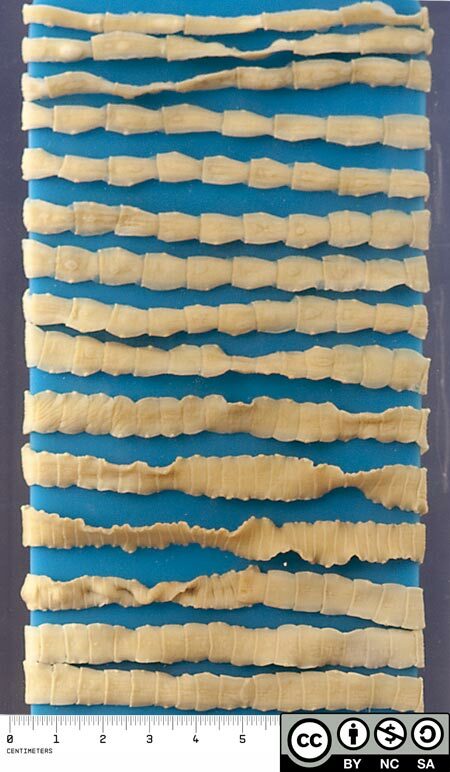 Calcified cysticerci are by far the commonest cause of this picture. Cysticerci embedded in tissue seldom exceed 2cm in diameter. 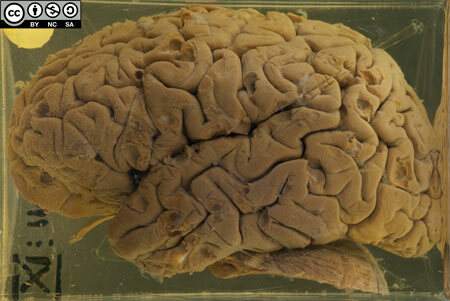 A rare, progressive and virtually untreatable form of neurocysticercosis is cysticercus granulomatous meningitis (or subarachnoid neurocysticercosis). 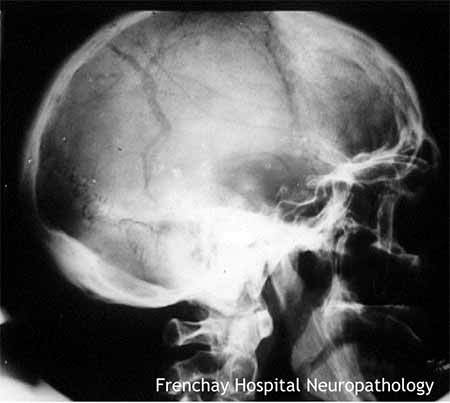 A fatal case of basal cysticercus meningitis is shown below, with a corresponding MR image. The prevalence of antibodies to Taenia solium infections is low in urban South Africans but rises to ± 10% in rural populations, with the highest prevalence (20%) in the Eastern Cape (esp. 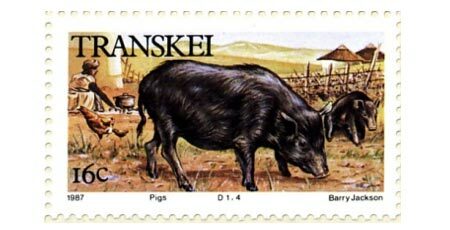 former Transkei) - most likely linked to the lack of human sanitation combined with the common practice of free-range pig farming. 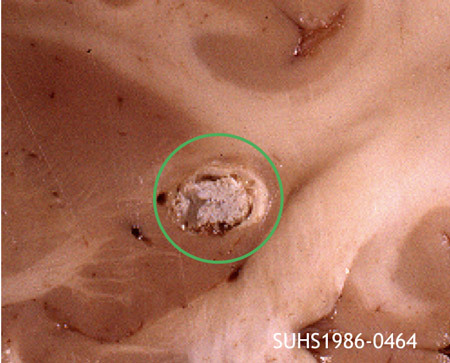 In 2004 it was estimated that there were 34 500 neurocysticercosis-associated cases of epilepsy in the Eastern Cape. Although cysticidal drugs (praziquantil or albendazole) are effective in neurocysticercosis they must be used with caution as they can exacerbate acute inflammation and scarring. Most cases of parenchymal neurocysticercosis run a benign course with seizures decreasing with time as the cysticerci naturally regress. Use of cysticidal drugs is therefore not routine. Anti-epileptic drugs may be required for months or years. 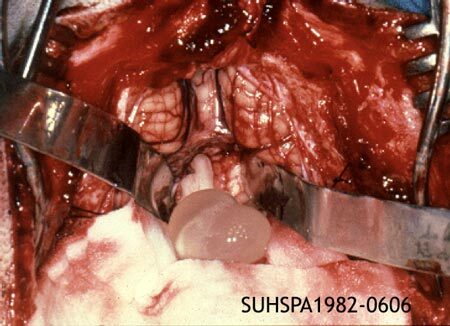 Large extra-parenchymal cysts may call for ventriculoperitoneal shunting and/or surgery, but many cases respond to cysticidals used in combination with corticosteroids. 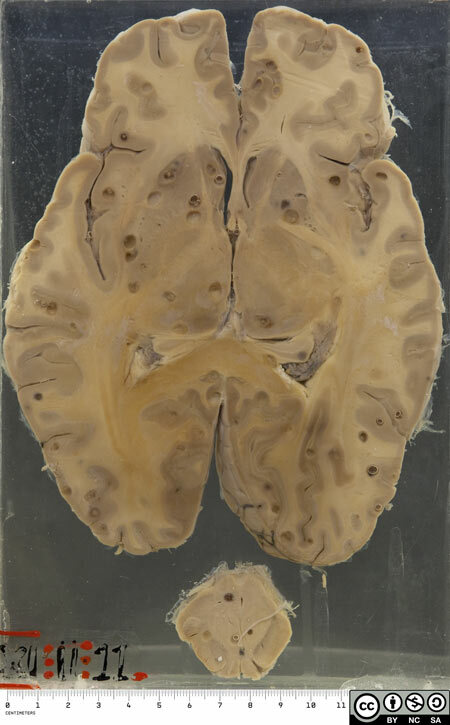 Despite cysticidal treatment, meningeal cysticercosis has a poor outcome due to meningeal fibrosis, hydrocephalus and brain infarcts secondary to vasculitis. Sinha S & Sharma BS. Neurocysticercosis: a review of current status and management. J Clin Neurosci. 2009;16(7): 867-76. Mafojane NA, Appleton CC, Krecek RC, Michael LM, Willingham AL. The current status of neurocysticercosis in Eastern and Southern Africa. Acta Trop. 2003;87(1): 25-33. Carabin H, Krecek RC, Cowan LD, Michael L, Foyaca-Sibat H, Nash T, Willingham AL. Estimation of the cost of Taenia solium cysticercosis in Eastern Cape Province, South Africa. Trop Med Int Health. 2006;11(6): 906-16. This patient had a 3 month history of generalised seizures and confusion. She was completely mute and unresponsive. She died quite suddenly following a generalised convulsion. 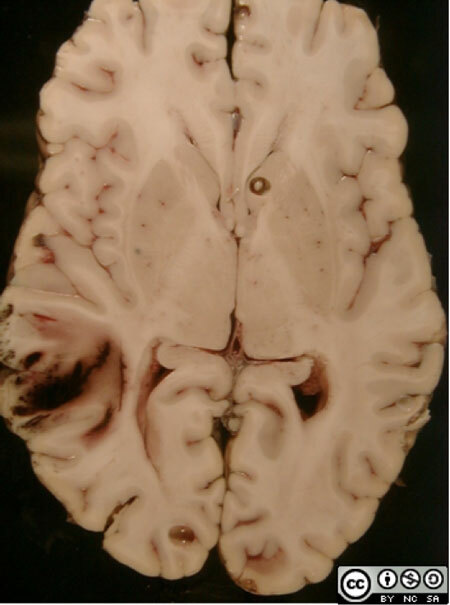 At autopsy there were innumerable cysticerci throughout the brain. 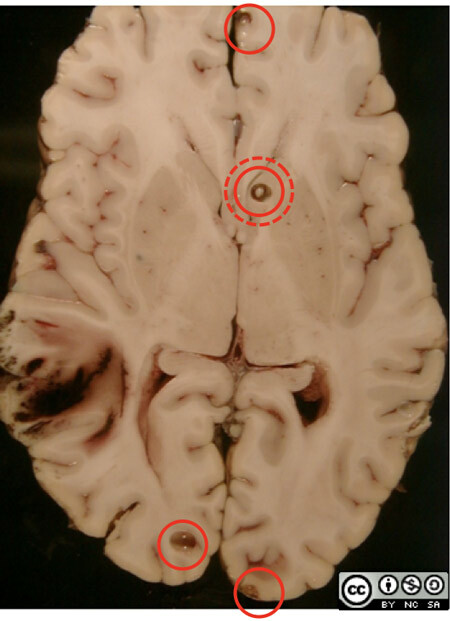 Shown is a slice at the level of the basal ganglia, and a section of midbrain. Many of the cysticerci still contain their protoscolices. They are mainly in the grey matter but there are a few in the white matter. In this case there is also a very heavy infestation of cysticerci embedded in the parenchyma, as well as many projecting from the surface leptomeninges and into the lateral ventricle.